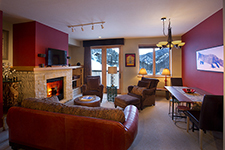 The Edelweiss Lodge and Spa is truly at the peak of luxury in the Taos Ski Valley. Located on the Strawberry Hill slope and in the main base village area, the Edelweiss features true ski-in/ski vacation reantals. All guests are provided with boot lockers complete with boot dryers in our locker room on the first floor. The on-site Alpine Extreme Ski Shop provides all guests with complimentary ski/pole/board valet service and is located just 15 feet from the slopes. In addition, each reservation is granted complimentary parking in our on-site underground heated parking garage. 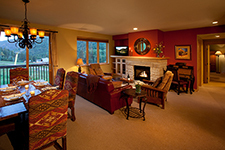 Edelweiss Lodge offers one, two, and three bedroom condominiums as well a limited number of lock-off hotel rooms. Each condominium has a full kitchen, living room, dining area, washer/dryer, gas fireplace, satellite television, and high speed internet. Some condominiums have exterior balconies. Each lock-off room has a single bedroom and bathroom with a single king or queen bed (a couple have a pair of twins). All nightly rates include daily maid service. The Edelweiss Spa offers a range of spa treatments including a variety of massage therapies, facials, body scrubs, and private yoga instruction. We highly recommend advanced reservations in the summer to assure availability of therapists. 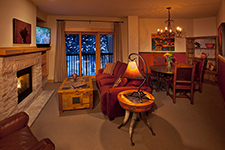 All Edelweiss guests have access to use of the exercise room, dry sauna, and an outdoor hot tub. The Blonde Bear Tavern opens mid-day with an Après Ski and begins offering a full dinner menu at 5:00. The adjoining lobby with its four sided fireplace is the perfect place to enjoy a glass of wine or a hot chocolate while sharing tales of exciting ski runs and perfect powder. The lobby game room has a television, pool table and foosball to keep the kids entertained. Hotel Rooms: These intimate lock-off “hotel rooms” provide a private bedroom and bathroom and are ideal for shorter stays and couples. 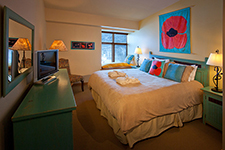 1 Bedroom Condos: Perfect for couples, our one bedroom/ one or two bathroom vacation condominiums offer all the conveniences of home with all the amenities of the Edelweiss Lodge & Spa. 2 Bedroom / 2 Bath Condos: Families and couples vacationing together will find our two bedroom/two bathroom vacation condominiums perfect with all the conveniences of home and all the amenities of the Edelweiss Lodge & Spa. 3 Bedroom / 3 Bath Condos:Perfect for large families and group vacations, our three bedroom/ three bathroom condominiums offer all the conveniences of home with the all the amenities of the Edelweiss Lodge & Spa.